I have a fantastic reason for not being able to spend much time blog hopping for Flower Friday the last few weeks. Ogre and I are collaborating with Revival House for their Third Thursday event at the local theatre March 16. The theme is "Comically Cinema" and they're screening "Doomed! The Untold Story of Roger Corman's ‘The Fantastic Four,’" followed by a Skype session with the director. But before the documentary starts, we're having a mini-convention in the back of the Milton Theatre! Ogre will be selling comic books and auction figures. I'll be selling my fantasy art prints, and am working on a special Fantastic Four fan art piece for the occasion. This morning I inked my drawing with black Sakura Pigma Micron Pens onto Strathmore Smooth Bristol Paper. 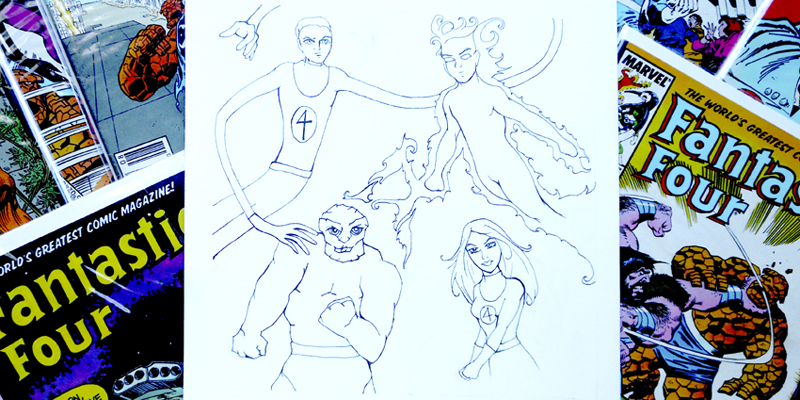 In addition to various Wordless Wednesday posts, my Fantastic Four fan art is linked at Sunday Sketches. Oh that sounds like so much fun!! Happy Sunday Sketches! That sounds like a fun event. Your artwork for the prints is looking "fantastic." Blessings! Im not good at sketching but love to make Zen Tangles. Love watching people sketch! I'm terrible at drawling! That's sounds great. I hope you post some pictures of that after the event! I bet you can't wait to add color to it. That's my favorite part. Aquariann, I'm glad I stopped off today to see your featured artwork and art supply recommendations. Next month, in the A-Z challenge I will be sharing my artist talent (or lack of) on my blog. I've put off and put off for years to keep an art journal or exercise my drawing skills, so I finally committed to doing an art sketch inspired by alphabet prompts. I hope you'll visit in April and offer any suggestions for improving. Have a good day! How exciting! Congrats on that. Congratulations on the collaboration! I'm late in visiting everyone for March 12 sunday sketches. Thanks for your visit last week.